NCERT Textbook Solutions are considered extremely helpful when preparing for your CBSE Class 8 Science exams. TopperLearning study resources infuse profound knowledge, and our Textbook Solutions compiled by our subject experts are no different. Here you will find all the answers to the NCERT textbook questions of Chapter 15 - Some Natural Phenomena. All our solutions for Chapter 15 - Some Natural Phenomena are prepared considering the latest CBSE syllabus, and they are amended from time to time. Our free NCERT Textbook Solutions for CBSE Class 8 Science will strengthen your fundamentals in this chapter and can help you to score more marks in the examination. Refer to our Textbook Solutions any time, while doing your homework or while preparing for the exam. Concept Insight: Only non-conducting materials (bad conductors of electricity) can be easily charged by friction. Copper is a highly conducting material. Therefore, a copper rod cannot be charged easily by friction. (b) The rod becomes positively charged, while the cloth has a negative charge. Concept Insight: When an object is charged by rubbing it against another object, the two objects get oppositely charged. By convention, it is considered that the charged acquired by the glass rod is positive and charged acquired by the cloth is negative. Therefore, the rod becomes positively charged and the cloth becomes negatively charged. Concept Insight: Like charges repel each other, whereas unlike charges that attract each other. Concept Insight: A charged glass rod has positive charges on its surface while a charged plastic straw has negative charges on its surface. Since unlike charges attract each other, a charged glass rod attracts a charged plastic straw. Concept Insight: During lightning, the lightning conductor (made up of metal) conducts all the atmospheric charges to the Earth directly, leaving the building safe. Hence, a lightning conductor protects a building from lightning. Concept Insight: Although the causes of earthquakes are known, but no instrument has been invented to predict them in advance. When we take off a sweater, it rubs against our shirt. The rubbing together of sweater and shirt produces opposite electric charges on them. The discharge of these electric charges produces tiny sparks of light as well as crackling sound. Human body is a conductor of electricity. So, when we touch a charged object, our body conducts its charges to the Earth. That is why a charged body loses its charge, if we touch it with our hand. This phenomenon is known as electric discharge. The destructive energy of an earthquake is measured by the Richter scale. This scale has the readings from 1 to 12.The reading of magnitude 3 on the Richter scale would be recorded by a seismograph. If the Richter scale gives a reading of magnitude 3, then the earthquake is not likely to cause much damage. Generally, earthquakes having magnitudes higher than 7 are really destructive earthquakes. (i) Stay in a completely closed place. If you are moving in a car, then remain there till the lightning is over. Close the windows of the car immediately. In first case, a charged balloon repels another charged balloon as both have like charges and like charges repel each other. In second condition, an uncharged balloon gets attracted towards a charged balloon because the charged balloon induces opposite charge on it. This process of inducing charge on an uncharged body by bringing it close to a charged body is known as induction. An electroscope can be used to detect whether a body is charged or not. The following figure shows a simple electroscope. It consists of a metal rod. At one end of the rod, two leaves of aluminium foil are fixed and at the other end, there is a metal disc. 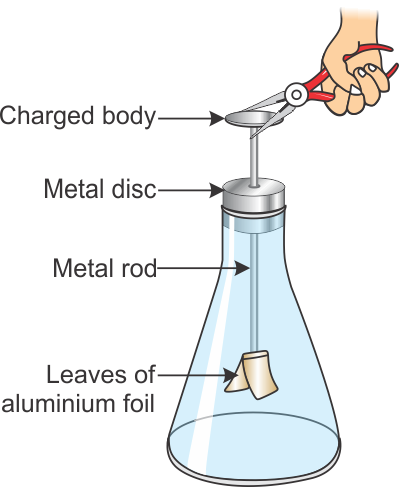 The leaves of aluminium foil are placed inside a conical flask and the flask is corked to isolate the leaves from air. When the metal disc is touched with a charged body, the aluminium strips move away from each other. This happens because some of the charges of the body are transferred to the strips through the metal rod. This method of charging a body is called charging by conduction. The nature of charges on both the leaves is similar. Hence, both the leaves of the aluminium foil move away from each other. If, however, the body is not charged, then the two leaves remain as they are. They do not repel each other. (i) We should try to find an open field away from tall buildings, installations, tall trees, and electric wires and poles. (ii) If travelling in a bus or a car, then we should not come out of it, instead we should drive the vehicle slowly to a clear spot away from buildings, trees etc. No. We should not carry an umbrella in a thunderstorm. During thunderstorm, which is accompanied by lightning, electric discharge from the clouds can travel through the metallic rod of the umbrella. This may give an electric shock to the person who is carrying it. Hence, it is not safe to carry an umbrella during lightning. TopperLearning provides step-by-step solutions for each question in each chapter in the NCERT textbook. Access Chapter 15 - Some Natural Phenomena here for free.